I have recently visited Mythos, a new licensed Greek restaurant that recently opened in JLT, cluster P at Armada Blue Bay hotel. If you want to reach the restaurant by car, be ready to get a headache. Find parking in JLT might be challenging and most of the time it is time limited: 3 hours free parking and then you have to leave. The hotel valet parking charges you 50 AED, hence better to get a taxi or the metro and walk a bit. Once you enter the hotel, get the elevator and go to the basement. You have to walk in the parking and then in a narrow corridor appositely built that escorts you to the restaurant. We booked our table well in advance since a friend recommended us to do so, but we found the 6 of us squeezed in a table for 4!! However, we managed to sit and order. With great surprise we discovered that the Greek beer and house wines were unavailable (at 8pm on a Thursday night!!!) so we ended up drinking Belgian beer at the Greek restaurant. We ordered some appetizers like the grilled octopus and calamari. We ordered 4 appetizers and we got 3 at the same time and the 4th one 10 minutes later!! Note that the restaurant provides you with some fresh bread and olives once you place your order but you have to pay 5 AED extra if you want the famous Greek pita bread. The octopus was very minimal and definitely not worth 72 AED. As main I ordered a pork souvlaki, one of the favorite meals I had while in Cyprus. Unfortunately, I received an almost cold meal meaning that either the souvlaki was cooked in advance and reheated later or that was cooked on the spot but then left in the plate for quite a long time before reaching our table. The fries were alright and the pork skewers came with tatziki sauce, onions and pita bread. The service wasn’t really the best. Many staff members seemed quite confused, especially those taking our order. Moreover, we waited 20 minutes and we had to ask to 5 different people before getting the bill. The restaurant has good potentials but needs some improvements. 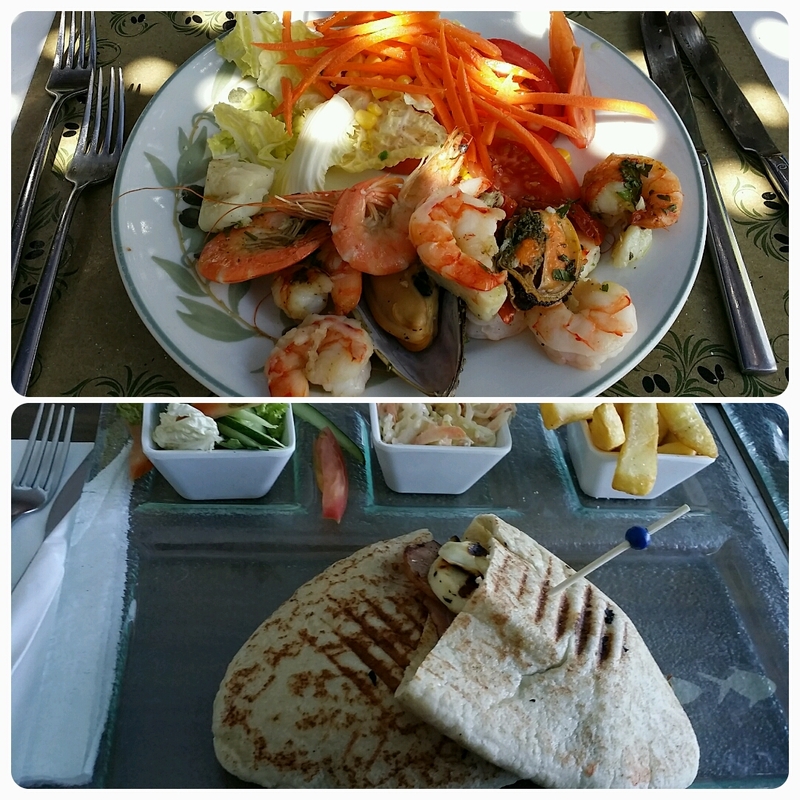 This entry was posted in Greek Food, JLT, Restaurant in Dubai, Restaurant Review and tagged dubai, Food, food lovers, Foodaholic, Greek, JLT, Octopus, pork souvlaki, souvlaki, tzatziki on February 14, 2016 by andreadetto. 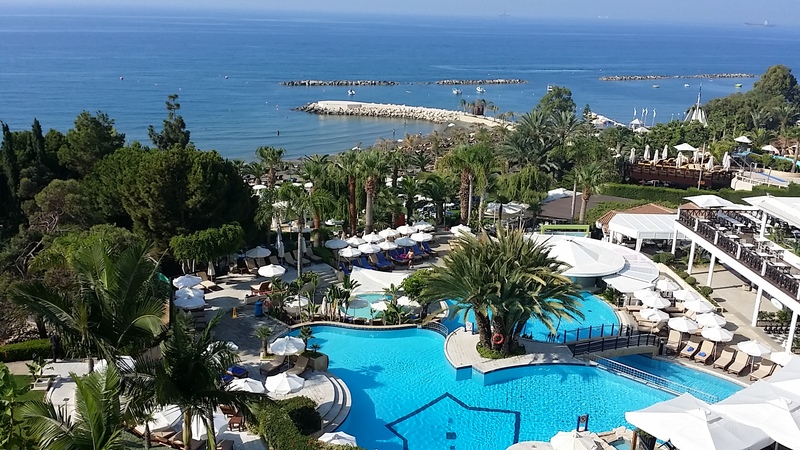 We stayed in this hotel during our stay in Limassol and we were positively impressed by the beauty of the hotel and its facilities and by the almost perfect service offered. Quality of the food and management of pools and beach facilities are outstanding as well as the provided entertainment and security services. The hotel had just few negative points that you might want to consider in order to keep under control your expenses and properly plan your stay. We reached Limassol from Paphos by using the Intercity Bus, a very convenient mean of transportation that connects the major cities in Cyprus and hopped off at Old Limassol Port. From there we caught Bus 30 and reached the hotel in 20/25 minutes. Indeed, the hotel indeed is quite far from the city centre. When we arrived at the hotel, the doorman (a single doorman) was busy with someone else, hence we had to carry our luggage by ourselves. The check in was quick and hassle free and appreciated the warm welcome the desk operator gave us. When we reached our room, we found a bottle of spumante (sparkling wine from Italy) and a chocolate mousse cake to celebrate our anniversary. Really a nice touch we have appreciated and the cake . . . wow it was super good. The room was spacious and well-furnished and the bed very comfortable. The washroom was alright even though there weren’t as many amenities as we expected. No shaving kit, no toothbrush or paste, hence you might want to take them with you and no bathrobe or slippers. The shampoo and soap provided, on the contrary, were of great quality. The best part of the room was the balcony and the fantastic view offered. We have immediately enjoyed the beach and the pool facilities that looked so inviting. We had to collect our towels from the gymnasium and select an available chaise lounge. We were impressed by the cleanliness of the hotel and by the efficient security service that were patrolling the facility and quickly block beggars or unauthorized sellers. The beach facility was very well maintained, clean and enjoyable. The hotel policy is that you cannot secure your bench for more than one hour in your absence. This solution guarantees a constant availability of lounges and reduces the number of complaints from other guests. The sand is dark color and it gets very very hot during the day, hence remember to wear flip flop or other beach shoes to move comfortably from/to the sea and around. One negative note is the price of food and drinks served at the beach or the pool. After few hours under the sun, we had to order some drinks: a big bottle of water and a lemonade. Nothing special but we ended up paying few Euro for a bottle of local water that in the street shops in front of the hotel costs 0,50/0,75 Euro. Same for other drinks and cocktails that are slightly more expensive than the average prices we have paid outside the hotel. Food is superb even though a bit pricey if you decide to go A La Carte. The most convenient option is to get advantage of the excellent daily buffet that is cheaper and provide you with a great variety of food options.. Just to have an idea: we had a lunch buffet for something around 20 Euro per person, while a single main course was around 15 Euro. We found the service always excellent and attentive. The hotel is very alive and provide a great selection of entertainments that is weekly repeated. We had the chance to enjoy a Greek buffet at one of the many restaurants available and the entertainment was amazing with Greek music and dancers and an extraordinary equilibrist who was holding a tower of 20 glasses on his head. there were other organized nights with Italian buffet, live Jazz music and so on. Definitely a nice stay. The only little problem is that if you have a sea view room and want to stay in your room and relax, you might be annoyed by the music and laughs that, however, eventually stop at 11pm circa. 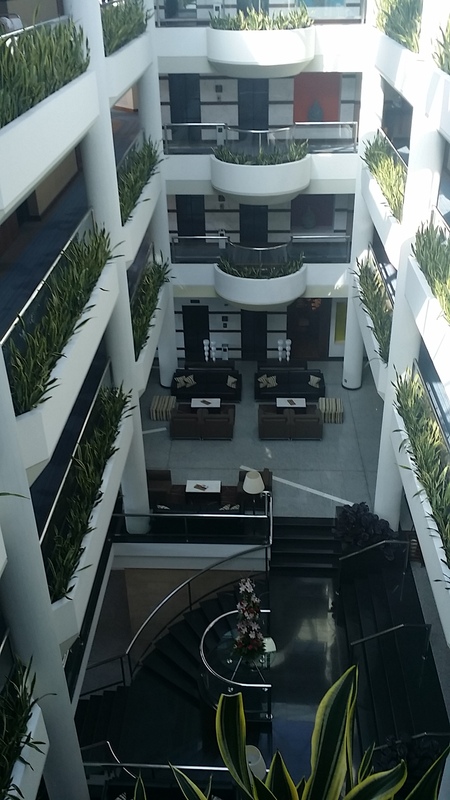 The hotel is very well decorated both inside and outside. – Photo rights reserved. The WiFi coverage is great and works perfectly in the rooms, restaurants, pool and beach area. Concierge and front desk operators were very helpful and polite and ready to answer to all our questions. Regarding the expenses, remember that water is not daily provided in your room and hence you are forced to buy it from within the hotel. As already said, it is more expensive than outside the hotel and therefore you might want to smuggle it in your room from a local shop. It can seem silly, but if you drink an average of 2 bottles of water a day per person, you might easily save a 10/15 euro per day. The shops that are in the hotel should be avoided if possible. We have found magnets and other souvenirs costing even 10 times more than outside the hotel and swim suites costing up to 200 Euro while in the shops in Limassol city there are much cheaper options. Moreover, we asked for a late check out that was granted for few hours for a small fee of 15 Euro. If you have to go to the airport from the hotel, ask the concierge to book for you a shared taxi. It is really convenient because it will cost you only 12 Euro per person and it is much faster than the available buses. 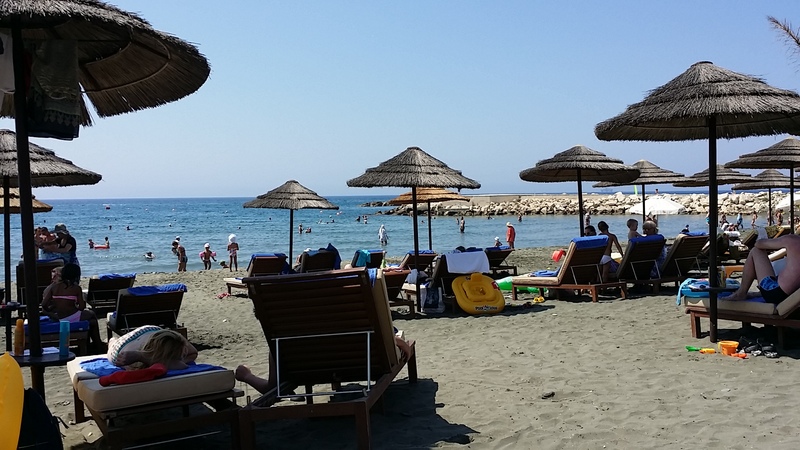 This entry was posted in Beach, Cyprus, Exploring, Holiday, Hotel Review and tagged beach, Cyprus, Greek, holiday, hotel, Hotel in Cyprus, Hotel in Limassol, Limassol, Mediterranean, Mediterranean Hotel Limassol, pool, review on August 2, 2015 by andreadetto.